Pros: Outdoor paradise with mild four-season weather. Cons: Home prices aren't cheap. If you don't think of Colorado as having much water, you clearly haven't been to Durango. Its name originates from the Basque word for "water town," thanks to the mighty Animas River, which flows almost parallel to Durango's Main Avenue. 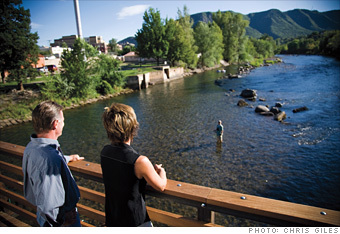 Vacationers flock here to kayak (the Animas has Class V rapids), wield their fly-fishing gear (rainbow and brown trout are plentiful) or simply take in water views (either from the town's 14,000-foot peaks, laced with hiking and biking trails, or from the network of shady parks that abut the river). Now many of those weekend warriors are retiring, setting up base camp in condos near downtown and feeding their outdoor addiction daily. Durango is also popular with artists, who draw inspiration from the surrounding San Juan Mountains. And this place is paradise for foodies: The town boasts almost as many restaurants per capita as San Francisco. The farmer's market here is a weekend ritual for residents stocking up on organic fruit, artisanal goat cheese and other local treats. In part because Durango snuggles up against the mountains, which limits the supply of buildable land, there has been no real estate bust here. The median sale price in La Plata County is up 18% through the second quarter of this year. Result: The typical three-bedroom home goes for $500,000, making Durango the priciest of the six towns on our list. On the plus side, property taxes are low (they're subsidized by the county's booming natural gas industry). Of course, where there are mountains there's usually snow. For most residents, that's just one more opportunity for recreation - such as skiing at Durango Mountain Resort, 25 miles to the north. Winters here are mild, with daytime temperatures often hitting the 40s and 50s. Summers are equally pleasant, with cool nights and 70° to 80° days.